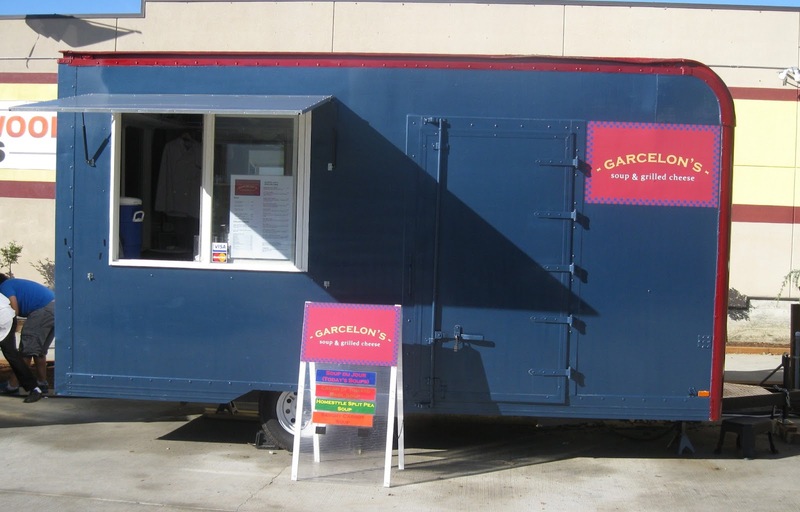 James Garcelon is the chef and owner. I found him to be both easygoing and serious, if that's possible. He seems like a relaxed dude, but when it comes to food, it's all business. The passion is there. I still remember how he mentioned how no more than three ingredients should ever go into a grilled cheese -- otherwise all those items tend to clash and you really start to get those diminishing returns on flavors. Good rule of thumb, and one that I honestly never paid attention to beforehand. James makes his soups fresh every morning. He usually has up to five different soups. His top seller is most likely the Cream of Tomato Basil. After all, what soup goes better with grilled cheese? Since I'm the ultimate spice seeker, I opted for the "Fire in the Hole" combo ($6.50). 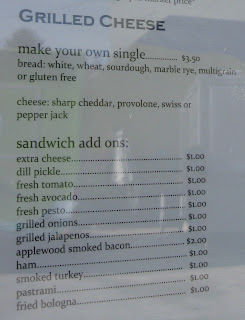 The sandwich contains pepperjack and grilled jalapenos on your choice of bread (I went with wheat). I of course went with the cream of tomato basil soup. Aside from wheat, you could get white, marbled rye, sourdough, multigrain, or gluten-free bread. A huge fan here. For me, I love that James uses a panini press. It's an even, thin layer of butter on the outside, enough to get that browned appearance and toasty crunch, but assuring the sandwiches will not be greasy to the touch. Furthermore...dude, the panini press leaves such a cool impression on the sandwich. Great melted pepperjack and properly grilled jalapenos. For my taste buds, it's extremely mild stuff, but I'm sure you know my spice tolerance by now. James even offered a small "shot" of sriracha in a tiny cup. You bet your last cent I accepted it. I'm sure you can get it as part of the grilled cheese itself if you ask. The tomato soup was a huge winner. Smooth consistency, full of tomato flavor. Most importantly, it's an awesome hot soup for those chilly days. 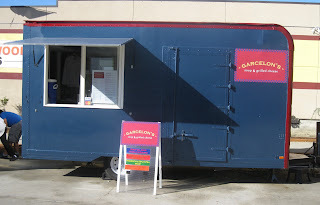 I really enjoyed the Spicy Crab Chowder here. Excellent consistency. A hint of spice, but you'll still be able to fully appreciate the crab. Hey, there are times when full-on heat has to stay neutralized. It may be $2 more, but well worth it! Each combo comes with some fresh lemon-limeade. That too is squeezed fresh each day. It's a tad on the watery side for me, but at least it's not a super-tart drink. 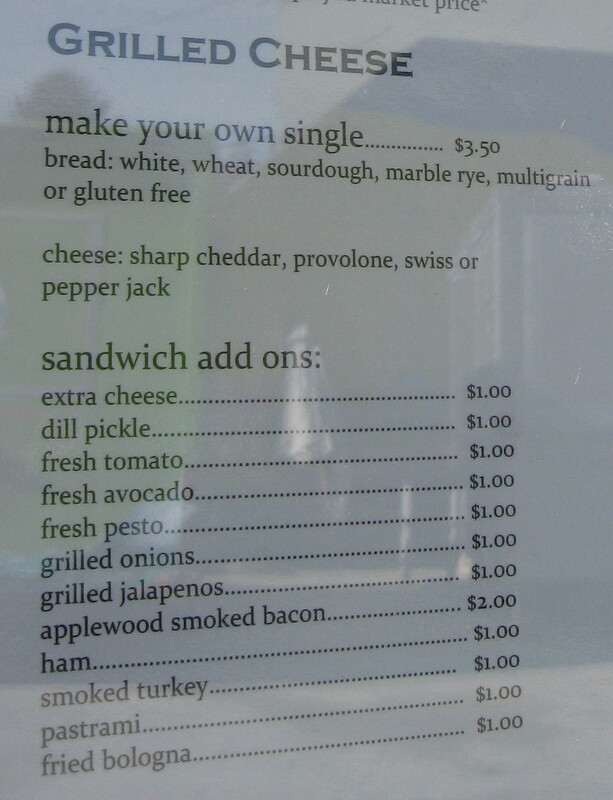 You can make your own grilled cheese as well. Price starts at $3.50, with add-ons usually about a buck more apiece. Being the glutton that I am, I tallied up what it would be to get a sandwich with everything in it (likely driving James off the proverbial deep end). Comes to $16.50 for one gluttonbomb. Does one dare to put in all the add-ons?